OH!! what cutie thanks asturiana. Vienna - Bilateral issues were forced into the background on Wednesday as Jordan's King Abdullah II and his Austrian hosts focused on the situation in the Middle East during the king's one-day visit to Vienna. Austria would renew its efforts in helping to bring about "fair and just peace that was advantageous for both sides" in the Middle East, President Heinz Fischer said after meeting with Abdullah. Thanks a lot for the great picture! Queen Rania looked much better today. I really liked the jacket of the lady behind Her Majesty. Thank´s pumkin pie for pic! I thought that Queen Rania had more events today, I hope see her tomorrow. I'll just link to this one. Thank you for taking the time and effort to post your photo! 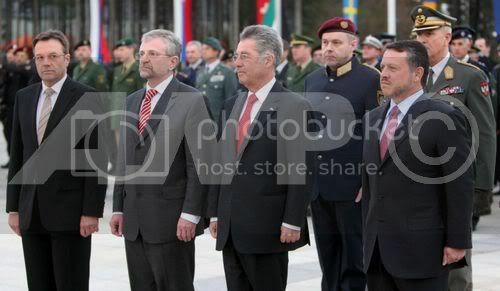 Queen Rania of Jordan is framed by bodyguards as King Abdullah II of Jordan and Austrian President Heinz Fischer (both out of camera range) take part on a 30th anniversary celebration of Austria' special forces police unit COBRA on April, 9, 2008 in Wiener Neustadt some 40 kilometers south of Vienna. I don't like this outfit, it is not a good co-ordinate. Brown, gray and white together like this is not so good. Her outfit earlier was so nice. What went wrong, even a smart coat in a light colour like the blue coat in France with nice shoes and bag would be better than this. She needs colour and co-ordinate more. Do you mind telling us a little bit about what she said, lilou? So far I have been unable to come across a transcript. I didn't like the outfit from yesterday's brief trip to Slovenia but she looks lovely in the photos from Austria. The outfit is very stylish and elegant. There's a transcript of her speech at the sorbonne on her official website Rania Al Abdullah Queen of Jordan Official Web Site It's in the press section, you'll have to look at the speeches, it is one of the most recent they have uploaded. King and President Fischer highlighted keenness to boost the bilateral ties in the various domains. King expressed appreciation for Austria for taking part in purchasing part of Jordan’s debt for Paris Club. Vienna, April 9 (Petra)-- His Majesty King Abdullah II and Austrian Chancellor Dr. Alfred Gusenbauer affirmed their determination to work together to enhance cooperation between Jordan and Austria and to boost partnership between the two countries in economic and political areas. During the talks between His Majesty and the Austrian Chancellor on Wednesday in Vienna, the two sides discussed mechanisms to activate bilateral relations in addition to the conditions prevailing in the Middle East. A video link about the vistit to Austria. derStandard.at along the right hand colum (second pic from top) you will see a picture of Queen Rania and King Abdullah - click it - now a website will open including the video on the left hand side - click "play"! Thanks pumkin pie for the video and the pictures . Amman, April 10 (Petra)—Their Majesties King Abdullah and Queen Rania Al Abdullah returned home following a several-day European tour that included France, Slovenia and Austria. thanks salma for the photos of Rania and Carla they seems get long well together. It seems that both Queen Rania and Madame Sarkozy truly enjoyed communicating with each other. However, it is sad that we can not see the outfits. Thanks for the photos and videos. Carla and Rania looked like they got along quite well. I think they've met before. Several off-topic posts have been deleted. This thread is not the place for a discussion on Carla Bruni.